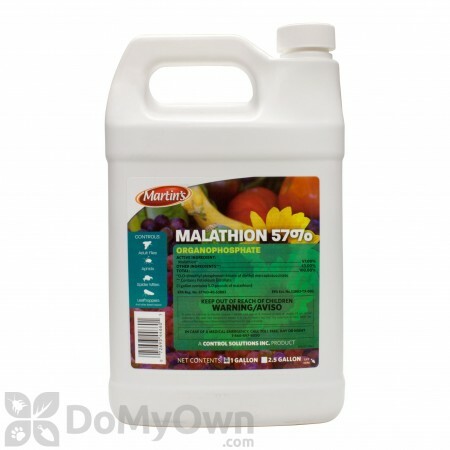 Malathion 57% is an emulsifiable concentrate containing 5 lbs. of Malathion per gallon. May be applied on vegetables, fruits, nuts, ornamentals, trees. I've been using Malathion to control insects outdoors for many years. This product can be used on most all plants with no harm, as well as outdoor surfaces and is the most effective product I've ever used . I even spray my mulched areas, house foundation areas, bricked porch and patio, especially to control ants. If you have ant problems this is the product you want to use. Be sure to follow all directions and I wear protective gloves as the product leaves a slight oil residue and odor on skin. Use in calm weather and dilute according to directions. You may not like the slight odor this product leaves behind but it will eventually fade away but so will your bug problem! ! ! Fantastic!!!!!!!!!! The best I've ever used in my garden. I use the product for general purpose outdoor control. I find it most effective for mosquitos. The cost of the Malathion is good as was the service from DMOPC. I will definetly order again. I have problems with mosquitos and biting flies. I've sprayed twice with Malathion 57% and have noticed a decrease in both pests. This product is a residual, so it lasts a bit longer than others that are not. The only downside is the heavy chemical smell, but given the results thus far, I can live with that. I've sprayed my plants and shrubbery, and so far have noticed no ill-effects. Many thanks to you guys for your help and patience. I'll be re-ordering again. When applying Malathion, what is the suggested mixture percentage per gallon of water for a fruit tree? 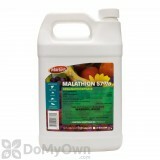 Malathion 57% is typically meant for treating large areas or crop land. The label typically calls for 1 to 1.5 pints per 100 gallons of water for fruit trees which works out to be .15 to .20 ounces per gallon of water. However, for safety and proper treatment you should find your particular fruit tree on the product label for accuracy and exact mixture ratios. When is it okay to water after applying Malathion 57% spray? Malathion is considered rain fast after it has dried. Give at approximately 4 hours to completely dry. Does malathion kill stink bug in vegtable gardens? Malathion 57% is specifically labeled for stinkbugs and should do a great job for you when used as directed on the product label. How long does Malathion last on a plant? Malathion 57% can last on plants for over 3 weeks. How do I mix Malathion 57% for flea infestations on animals and carpets? Malathion 57% is not labeled for use indoors or for use on animals. Tengard SFR is labeled for fleas and can be used indoors and on dogs (do not use on cats). It is important to vacuum prior to the application to help draw the fleas up from the carpet so that they may come into contact with the insecticide. Tengard can also be used to control fleas in lawns, which is often the source of a flea infestation. Adding an insect growth regulator such as Martins IGR can help disrupt the fleas breeding cycle and help control new infestations of fleas for up to 7 months.